Do Your Data Recovery Professional is an easy-to-use yet powerful file-recovery tool. It quickly recovers deleted files, even if you have emptied the Trash. It also can recover lost files due to formatting, OS crash, virus infection, power failure, OS upgrade, etc. The full-featured file-recovery software even can retrieve lost files from deleted, lost, or inaccessible hard-drive volumes. It supports recovery of lost data from all Macs, including iMac, MacBook, MacBook Air, Mac mini, MacBook Pro, Mac pro, Mac Server. It also can recover lost data from USB drive, SD card, memory card, external hard drive, digital camera, etc. What’s more, you can recover whatever you lost. It supports recovery of all types of lost files, including pictures, documents, videos, audio, archives, folders, emails, and more. 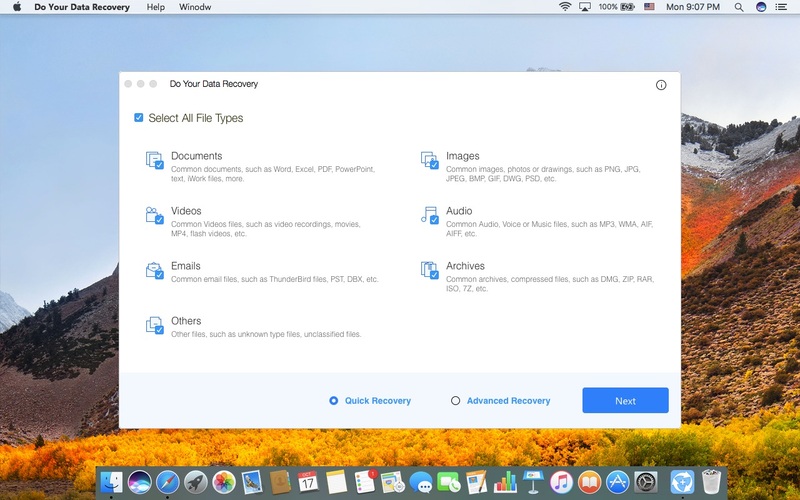 It offers two recovery modes for Mac data recovery. First of all, users can try the quick recovery mode to quickly recover deleted or recently lost files. If they can’t find all the lost files, they can try advanced recovery mode to scan the hard drive deeply. It will find much more lost files.